Cameras Downunder Gallery - 35 Millimeter/Akarette 35mm camera. photo 1. Akarette 35mm camera. photo 1. 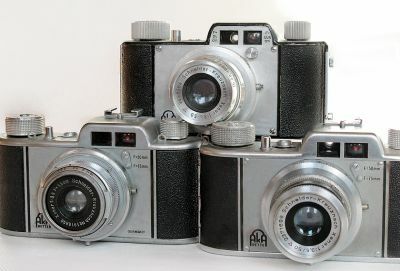 Three Variation of the Akarette 35mm camera. left. Akarette-1, chrome face late, Self timer, two finders 4.5.5cm and 7.5cm, ca.1948. Top. Akarette-11, now the cameras have strap lugs. ca.1950.